PROS 650CV Random Orbital Sander. The Pneumatic Random Orbital Sander - MIRKA PROS 650CV (Central Vacuum) is developed in-house by the Mirka industry leading design team. It is packed with clever features and attention to detail which has created an efficient and effective sanding tool that is perfect for professional operators. MIRKA PROS 650CV has a five millimetre orbit and has been specially developed to produce maximum dust extraction, even at low suction power, thanks to a wider dust suction outlet in the machine housing which substantially improves dust suction efficiency. Technical Specifications Power(W): 270 Speed (rpm): 12000/min Orbit (mm): 5 Size of pad (mm): 150 Size of pad (in):6 Weight (kg): 0.93 Noise Level, LpA (dB): 75 Vibration level (m/s): 3.2 Dust system: Central vacuum ready Work pressure (bar): 6,2 Backing Pad included Air consumption (l/min): 485. 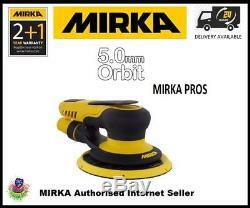 The item "Mirka PROS 650CV 150mm Central Vacuum 5.0mm Air Powered Random Orbital Sander" is in sale since Tuesday, July 31, 2018. This item is in the category "Vehicle Parts & Accessories\Garage Equipment & Tools\Air Tools\Air Sanders". The seller is "mpdistribution2013" and is located in CHESTER. This item can be shipped to United Kingdom, Austria, Belgium, Bulgaria, Croatia, Cyprus, Czech republic, Denmark, Estonia, Finland, France, Germany, Greece, Hungary, Ireland, Italy, Latvia, Lithuania, Luxembourg, Malta, Netherlands, Poland, Portugal, Romania, Slovakia, Slovenia, Spain, Sweden, Australia, United States, Canada, Brazil, Japan, New Zealand, China, Israel, Hong Kong, Norway, Indonesia, Malaysia, Mexico, Singapore, South Korea, Switzerland, Taiwan, Thailand, Saudi arabia, South africa, United arab emirates, Ukraine, Chile.